This chapter presents the details of TLBO algorithm, NSTLBO algorithm, Jaya algorithm and its variants named as Self-Adaptive Jaya, Quasi-Oppositional Jaya, Self-Adaptive Multi-Population Jaya, Self-Adaptive Multi-Population Elitist Jaya, Chaos Jaya, Multi-Objective Jaya, and Multi-Objective Quasi-Oppositional Jaya. 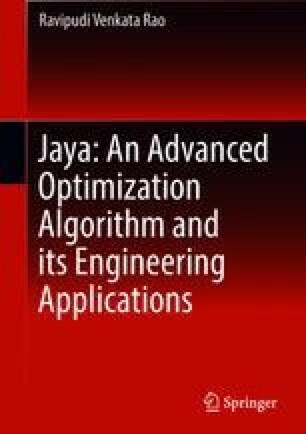 Suitable examples are included to demonstrate the working of Jaya algorithm and its variants for the unconstrained and constrained single and multi-objective optimization problems. Three performance measures of coverage, spacing and hypervolume are also described to assess the performance of the multi-objective optimization algorithms. Rao, R. V., Rai, D. P., Balic, J. (2016). Multi-objective optimization of machining and micro-machining processes using non-dominated sorting teaching–Learning-based optimization algorithm. Journal of Intelligent Manufacturing, 2016. https://doi.org/10.1007/s10845-016-1210-5.